Zimbabwe yesterday marked 14 years since the death of Dr Joshua Nkomo, one of the founding fathers and architects of the country’s post-independence development. 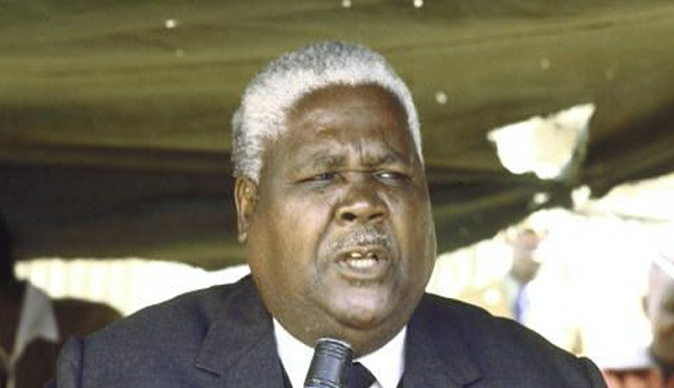 Vice-President Nkomo died of prostate cancer in Harare on 1 July 1999 aged 82. The day when the much-loved Father Zimbabwe, or Umdala Wethu died was one of the saddest in Zimbabwe’s history. Probably for the first time since his demise, Zanu-PF and the Joshua Nkomo National Foundation (JNNF) have put together a weeklong schedule of events to recognise the icon in a more systematic manner. The events include lectures, cultural fests and exhibitions being held at various places in Bulawayo. In death as during his lifetime, Dr Nkomo has had a profound influence on Zimbabwe and its people, said Zimbabwe National Liberation War Veterans’ Association chairman Cde Jabulani Sibanda yesterday. “When you think about Joshua Nkomo, you remember the work he did to liberate this country,” said Cde Sibanda. “You remember the war that he fought so that blacks recover their dignity which they were deprived of during colonialism. He reminds us of self-determination and that all the land of Africa belongs to Africans, that all land of the Americas, belongs to people of that area and that all land of Asia belongs to Asians. “He taught us that we must not to tamper with neighbour’s home and neighbour here does not necessarily mean the house next door. In this case it also means another country. You don’t go there and impose yourself,” he said. Dr Nkomo was born on 19 June 1917 to Thomas Nyongolo Letswana Nkomo in the then Semukwe Reserve in Matabeleland South Province. After completing his primary education, he trained as a carpenter at the Tsholotsho Government Industrial School in Matabeleland North and later became a driver. Shortly after that, he worked as a teacher, specialising in carpentry at Manyame School in Kezi. In 1942, he left the country to further his education in South Africa where he attended Adams College and Jan Hofmeyer School of Social Work. While in South Africa, he studied for a Bachelor of Arts Degree in Social Work and returned home in 1948 and landed a job at the then Rhodesia Railways (now National Railways of Zimbabwe) as a social worker, becoming the first African to be appointed to the position that was regarded as prestigious for blacks then. He then studied for a Bachelor of Arts Degree in Economics and Sociology with the University of South Africa (Unisa). In 1951, he was instrumental in the formation of the African National Congress of Rhodesia. This party was however banned by the settler regime. The banning of the party did not extinguish his nationalist disposition and that of his peers. In 1960, he was again key to the formation of another nationalist movement, National Democratic Party (NDP). He was elected its president but the party, like its predecessor, was banned. In 1962, Dr Nkomo and other political figures formed the Zimbabwe African People’s Union (Zapu). Again Zapu was banned on 20 September, 1962. The consistent banning of the political parties he led got him and some of his peers thinking. They decided to form a Zapu government in exile. Some of his fellow comrades did not like this, so Zapu split in 1963. Zimbabwe African National Union (Zanu) was formed. However, the two parties maintained their mutual comradeship that saw them prosecuting the liberation war jointly albeit from two different fronts — Zambia for Zapu and Mozambique for Zanu. They fought side by side under the Zimbabwe People’s Army (Zipa), negotiated for majority rule as one front, pressing for the same agenda. So while they were two separate armies and parties, they were essentially one because everything about them was the same, from ideology to fundamental objectives and how they were to be achieved. On 16 April 1964, Dr Nkomo was arrested, detained and spent the next 10 years at the notorious Gonakudzingwa detention camp, in the malarial and hot southeast Lowveld. After his release, he left the country for Zambia where he prosecuted the armed struggle under the banner of Zimbabwe People’s Revolutionary Army (Zipra) which he led as its commander-in-chief. Zipra and Zanu’s military wing Zanla won the liberation struggle against the Ian Smith regime and at Independence, Dr Nkomo was part of the unity government as Minister of Home Affairs. On 22 December 1987, he signed the Unity Accord that ended civil disturbances in Matabeleland and parts of Midlands and took up the post of Vice-President of the country. He championed unity, peace and national development in that capacity for 12 years until he died on 1 July, 1999. Zanu-PF Politburo Secretary for the Youth League, Cde Absalom Sikhosana said the party was continuing with the pledge its leadership made when burying the nationalist at the National Heroes’ Acre in Harare which was to maintain peace and unity regardless of one’s tribe or race. This spirit of unity, Cde Sikhosana said, must guide the party as the country moves towards the harmonised elections on 31 July which, he predicted, Zanu-PF would win. Cde Sikhosana said Dr Nkomo was one of the pioneers of nationalism although the dominant view in the 1940s to the 1960s was that politics was for the uneducated. Cde Sikhosana urged the people to safeguard the gains of the liberation struggle and be confident to rule themselves. Yesterday, the JNNF held an event at Stanley Square in Makokoba to launch the weeklong commemorations of the late icon’s life and works. On the other hand, Zanu-PF is also working on its own complementary programme which will culminate in a massive event on Saturday at White City Stadium. The JNNF is requesting for public support for its ongoing and planned projects such as the Joshua Nkomo Museum in Bulawayo, the Joshua Nkomo Open Chess Tournament for scholars (Saturday 30 November), the Joshua Nkomo Corporate Fun Run — (24 August), Umdala Wethu Music Festival (31 August), Joshua Nkomo Marathon (28 September), the Joshua Nkomo Golf Classic and the Umdala Wethu Charity Cup whose final is scheduled for Unity Day 22 December. Cde Sibanda urged Zimbabweans to wake up to new threats to their national independence saying when whites invaded the country in 1890, they brought guns to face locals who were armed with only bows and poisoned arrows. Now, he said, the same outsiders have changed their ways a bit — they use money to corrupt the people and illegal sanctions to cow them. The basic objective of the foreigners, said Cde Sibanda, remains the same — to sustain their hegemonic ambitions over Zimbabwe. “Dr Nkomo was a man of peace,” he added.